...come again another day. Preferably after we plant our grass seed. Here in Northeast Ohio, we've had a very wet spring, so much so that we've barely had more than a couple days of sun scattered between rain. 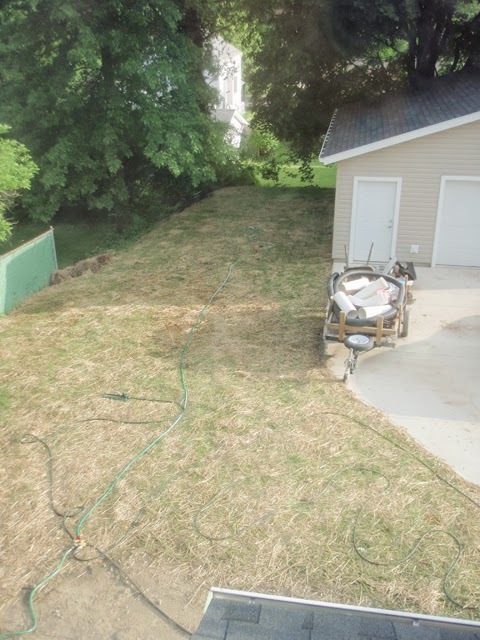 Although it's been non-stop rain for awhile now, we finally got a reprieve last week and was able put our grass seed in. The problem wasn't getting the seed down, it was getting the dirt to dry up enough to put the seed in. A couple weeks ago we had three truckloads of topsoil delivered and one rainy evening Mike was able to spread it out with the help of a bobcat our neighbor graciously rented for us. He either felt bad watching Mike and I spend two hours with a wheel barrel and some shovels and get about 4 square yards done, or he was tired of looking at our dirty backyard. Probably a little of both. While the topsoil was a huge task to get spread out, the toughest part was waiting for the rain to stop. With each downpour, the dirt would soak up more water, and more little puddles would form. After looking at our dirt for the past year, I was ready for some grass! When we finally got some sunny weather two weekends ago, Mike wasted no time using the rototiller to loosen up the soil to help it dry. After about 10 or so passes (not an exaggeration!) it was finally dry enough, (or as dry as it was going to get), to spread some seed. We had various types of grass seed according to the level of shade throughout the yard, and while Mike continued to turn over the soil, I used a handheld spreader to spread the seed. Since we were fighting the hot weather, the spots of mud, and general exhaustion, there aren't any photos. I'm sure you can imagine me wandering around in circles throwing grass seed everywhere, while Mike manhandled the rototiller into submission. By the time we were ready for the straw, our neighbor, including his two boys, came home and were willing to help throw straw in the air and get dirty gently spread straw around. It worked out perfectly since the boys, ages 6 and 7, weigh no more than a sack of flour, and were able to run around throwing straw without getting caught in the mud, like Mike and I.